I can’t post today without first mentioning Japan & the earthquake. I have lived 2 miles from the San Andreas Fault in California my entire life living with the fear of the “Big One”. Japan’s devastation is so terrifying to me not only because it is too horrible to describe, but because it will one day happen in California. I can’t stop thinking about the people in Japan and how their lives have been changed forever. There are so many ways we can help out. The Red Cross, Save the Children, Doctors Without Borders, and Global Giving are just a couple of the places to donate. You can also join in with other bloggers in For Japan with Love and there is a giveaway by She Who Eats where you can donate and be entered to win a Sakura baking set. Japan, I am sending my prayers. “Of course I want some! Bring over as many as you want. I am sure I can come up with something.” I head into the kitchen to find an empty bag and am overcome with excitement and a flood ideas for lemony treats. Then it hits me. These are not just lemons, these are Meyer Lemons. I do the happy dance as I head to the kitchen. I am excited. Ridiculously excited over this bag of lemons. Meyer lemons are not often found in stores. Even in California the only time I can get those sweet yet sour Meyer lemons is when some kind soul offers to share his backyard bounty. Meyers are so much better than other lemons. Their juice is sweeter and the skin is thin and flavorful, perfect for zesting. This is because Meyers are a cross between a true lemon and a mandarin orange. They make great container plants for anyone who lives in a relatively warm climate. Or if you live somewhere colder you can bring yours indoors for the winter like Tom’s mother did with her beloved Meyer lemon tree. I headed back outside to collect my golden treasure and during our conversation I discovered my neighbor had never tasted lemon curd. That settled it. 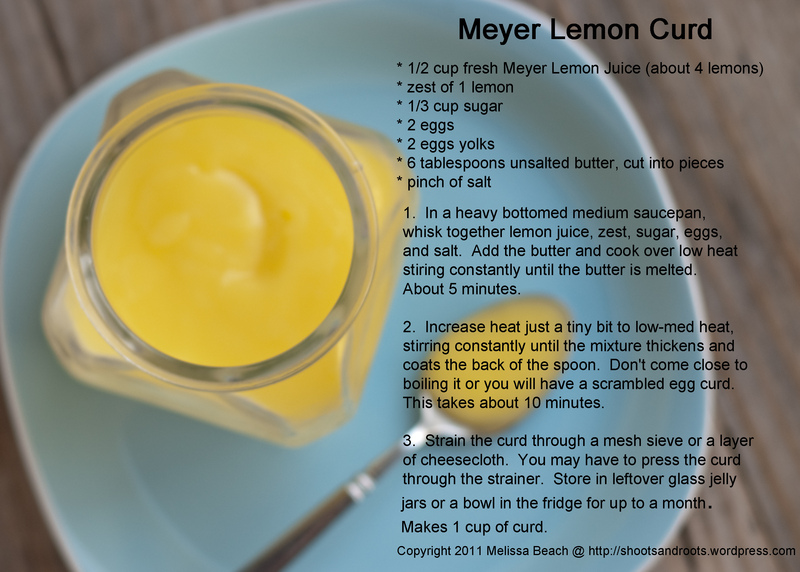 Meyer Lemon Curd it is. 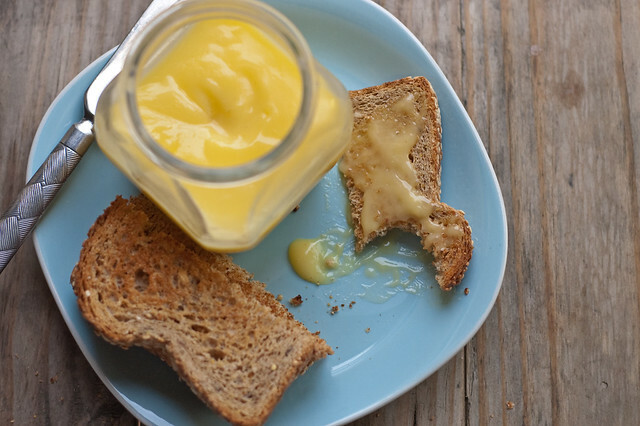 A curd is basically a custard without milk or cream. Perfect for people who have trouble digesting milk, like myself. 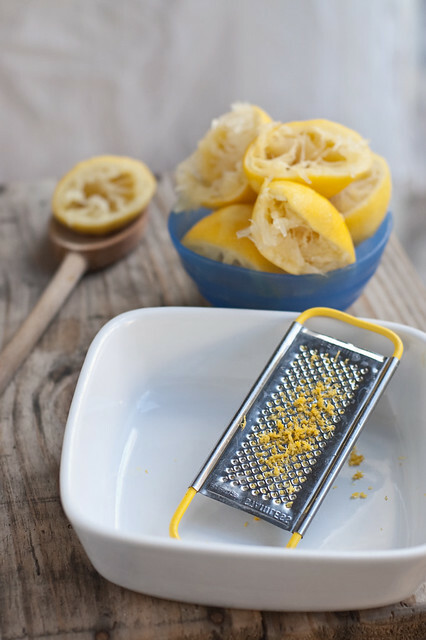 According to Alice Waters, curds can be made with any citrus fruit or even raspberries and blackberries. 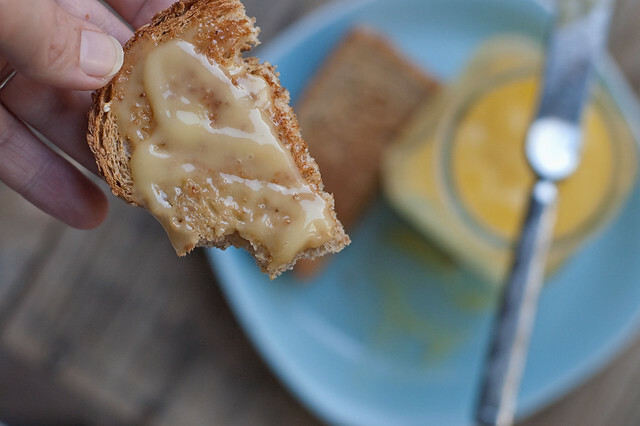 I’ve never eaten any other curd except lemon, but I love the idea of a raspberry or tangerine curd. Making curd is not too difficult, but you have to watch it closely. Heat the eggs too much or too quickly and you will have lemony scrambled egg bits floating in a sea of lemon butter. Just stir constantly with a whisk or wooden spoon over med-low heat until the mixture thickens and coats the back of a spoon. If you do end up with a little scrambled egg don’t worry, just strain the curd through a layer of cheesecloth and don’t tell anyone it happened. No one will know! The recipe I used is by David Lebovitz (found through Sprouted Kitchen) with a little advice from Alice Waters thrown in (she recommends using the zest and so do I). I like my curd with toasted whole wheat bread for breakfast or thumbprint cookies for dessert. Just balls of Pate Sucree squished by my thumb, baked, then filled with curd or jam. 1. 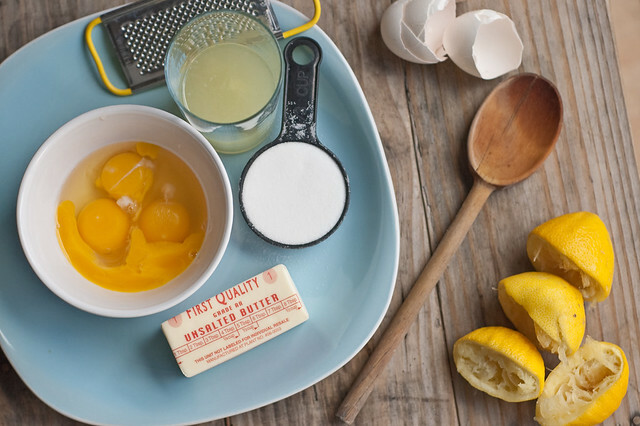 In a heavy bottomed medium saucepan, whisk together lemon juice, zest, sugar, eggs, and salt. Add the butter and cook over low heat stirring constantly until the butter is melted. About 5 minutes. 2. Increase heat just a tiny bit to low-med heat, stirring constantly until the mixture thickens and coats the back of the spoon. Don’t come close to boiling it or you will have a scrambled egg curd. This takes about 10 minutes. 3. Strain the curd through a mesh sieve or a layer of cheesecloth. You may have to press the curd through the strainer. Store in leftover glass jelly jars or a bowl in the fridge for up to a month. This looks delicious. Nice post, very thoughtful. such pretty photos! We go through a jar of curd much faster than we should, hence why i haven’t made it in awhile. I’ll have to try it with the zest. 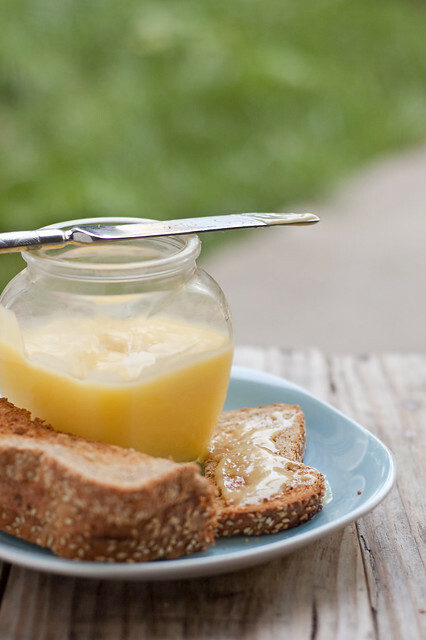 Never thought to make my own lemon curd, but this definitely inspires me to. Amazing photos, too!